OProfile Commands provides a brief overview of the most commonly used tools provided with the oprofile package. Creates annotated source for an executable if the application was compiled with debugging symbols. See Using opannotate for details. Configures what data is collected. See Configuring OProfile Using Legacy Mode for details. Recommended tool to be used in place of opcontrol for profiling. See Using operf for details. For differences between operf and opcontrol see operf vs. opcontrol. Retrieves profile data. See Using opreport for details. With operf, there is no initial setup needed. You can invoke operf with command-line options to specify your profiling settings. After that, you can run the OProfile post-processing tools described in Analyzing the Data. See Using operf for further information. Before OProfile can be run in legacy mode, it must be configured as shown in Configuring OProfile Using Legacy Mode. These settings are then applied when starting OProfile (Starting and Stopping OProfile Using Legacy Mode). Most processors contain counters, which are used by OProfile to monitor specific events. As shown in OProfile Processors and Counters, the number of counters available depends on the processor. The events for each counter can be configured via the command line or with a graphical interface. For more information on the graphical interface, see Graphical Interface. If the counter cannot be set to a specific event, an error message is displayed. Event Specifications summarizes these options. The last three values are optional, if you omit them, they will be set to their default values. Note that certain events do require a unit mask. The events available vary depending on the processor type. When no event specification is given, the default event for the running processor type will be used for profiling. See Default Events for a list of these default events. To determine the events available for profiling, use the ophelp command. This command also loads the oprofile kernel module, if it is not already loaded, and creates the /dev/oprofile/ directory, if it does not already exist. See Understanding the /dev/oprofile/ directory for details about this directory. Setting whether samples should be collected within the kernel only changes what data is collected, not how or where the collected data is stored. To generate different sample files for the kernel and application libraries, see Separating Kernel and User-space Profiles. Use OProfile Processors and Counters to determine the number of events that can be monitored simultaneously for your CPU type. If the processor does not have supported performance monitoring hardware, the timer is used as the processor type. If timer is not used as the processor type, the events monitored can be changed, and counter 0 for the processor is set to a time-based event by default. If more than one counter exists on the processor, the counters other than 0 are not set to an event by default. The default events monitored are shown in Default Events. To configure OProfile, follow the instructions in Configuring OProfile Using Legacy Mode. On a Fedora 26 system, the nmi_watchdog registers with the perf subsystem. Due to this, the perf subsystem grabs control of the performance counter registers at boot time, blocking OProfile from working. Samples for each executable are written to a single sample file. Samples from each dynamically linked library are also written to a single sample file. While OProfile is running, if the executable being monitored changes and a sample file for the executable exists, the existing sample file is automatically deleted. Thus, if the existing sample file is needed, it must be backed up, along with the executable used to create it before replacing the executable with a new version. The OProfile analysis tools use the executable file that created the samples during analysis. If the executable changes, the analysis tools will be unable to analyze the associated samples. See Saving Data in Legacy Mode for details on how to back up the sample file. OProfile allows you to profile dynamically compiled code (also known as "just-in-time" or JIT code) of the Java Virtual Machine (JVM). OProfile in Fedora 26 includes built-in support for the JVM Tools Interface (JVMTI) agent library, which supports Java 1.5 and higher. To learn more about Java support in OProfile, see the OProfile Manual, which is linked from Additional Resources. On the Setup tab, to set events for the processor counters as discussed in Setting Events to Monitor, select the counter from the pulldown menu and select the event from the list. A brief description of the event appears in the text box below the list. Only events available for the specific counter and the specific architecture are displayed. The interface also displays whether the profiler is running and some brief statistics about it. On the right side of the tab, select the Profile kernel option to count events in kernel mode for the currently selected event, as discussed in Separating Kernel and User-space Profiles. If this option is not selected, no samples are collected for the kernel. 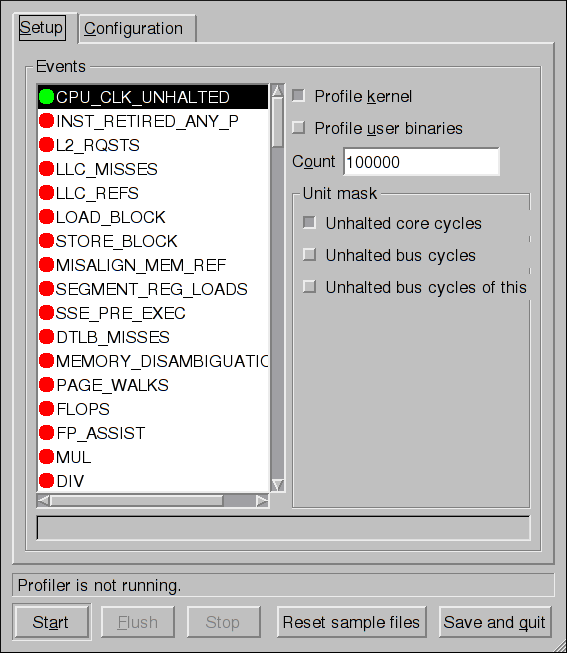 Select the Profile user binaries option to count events in user mode for the currently selected event, as discussed in Separating Kernel and User-space Profiles. If this option is not selected, no samples are collected for user applications. Use the Count text field to set the sampling rate for the currently selected event as discussed in Sampling Rate. If any unit masks are available for the currently selected event, as discussed in Unit Masks, they are displayed in the Unit Masks area on the right side of the Setup tab. Select the check box beside the unit mask to enable it for the event. If Per-application profiles is selected, OProfile generates per-application profiles for libraries. This is equivalent to the opcontrol --separate=library command. 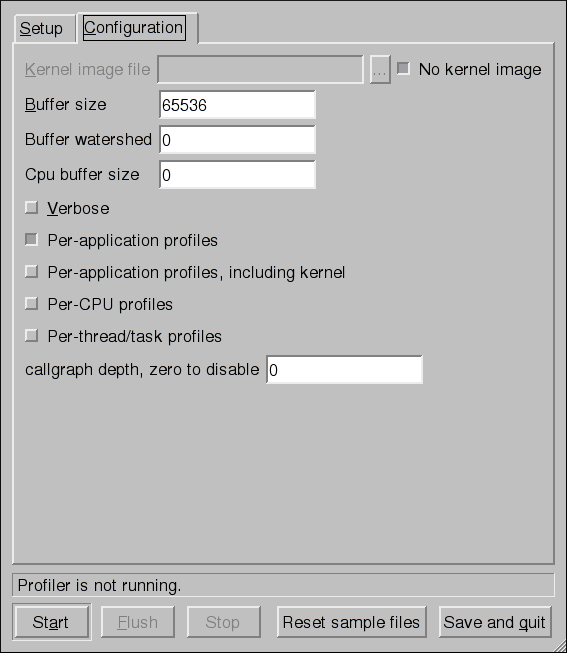 If Per-application profiles, including kernel is selected, OProfile generates per-application profiles for the kernel and kernel modules as discussed in Separating Kernel and User-space Profiles. This is equivalent to the opcontrol --separate=kernel command. To force data to be written to samples files as discussed in Analyzing the Data, click the Flush button. This is equivalent to the opcontrol --dump command. For more information on SystemTap, see Online Documentation for the relevant SystemTap documentation.